I was at a conference and missed the official E7 building opening, but below is a video showing some of the facility highlights. I walk through the building frequently, and I really like the environment. Nice open spaces, well lit, great and vibrant “energy”. There are always people around, talking, having events, and working together in one of the many gathering areas, drawing diagrams on the walls. Definitely seems like a pleasurable place to be. We will be in Houston, Texas for the NACAC STEM Fair on Sunday November 5 2017. This is the last of this year’s College STEM fair schedule in the U.S., and we’re looking forward to meeting lots more high school students and families. In past fairs I’ve met with a lot of sophomore and junior students who were checking out their options in various fields, and that’s very commendable. Waterloo’s Fall Open House is coming up soon, on Saturday November 4. Registration and other information is available online. These open houses are a very important opportunity to find out more about different programs, curricula, co-op, career paths and various other aspects. As I’ve noted before, you want to go into a program for all the right reasons and this is a chance to gather information and formulate those reasons. It doesn’t even have to be Waterloo’s open house! If you want to find out more about mechanical engineering (for example), your local university probably does something similar if Waterloo is too far away. Educationally, most accredited engineering programs across North America have similar course content within the same discipline, so what you find out about Chemical Engineering education and careers at Ryerson University will be more or less similar for the universities of Waterloo, Toronto, Saskatchewan, New Brunswick, British Columbia, etc. At Waterloo (or anywhere else), some of the best people to talk to are the students. They will give you their impressions about the program, examples of what they are doing or have done on co-op or internships, and information about student life. Talk to more than one student however, since everyone has a different experience, background, and perspective. Staff and faculty are good to talk to also, of course, since they can give a broader overview of things and have a longer-term connection with the program and its evolution. 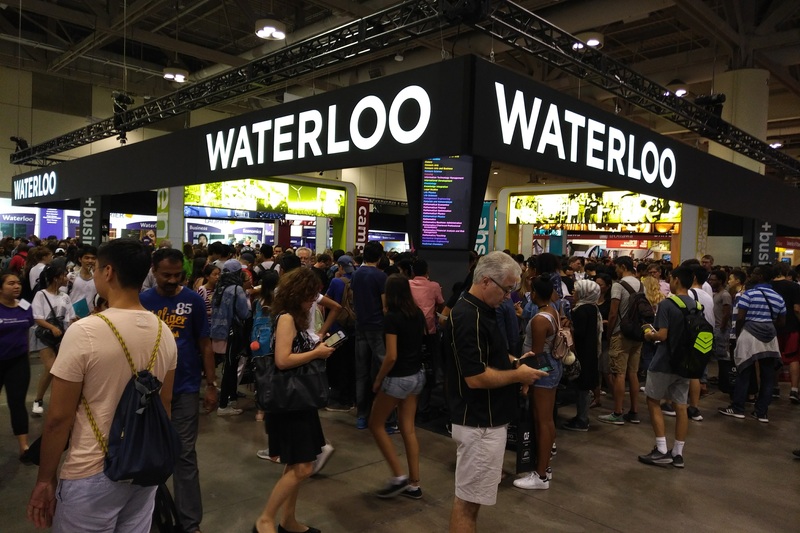 A crowd around the Engineering area of Waterloo’s booth. One of our most valuable resources for finding out about an engineering education and co-op work experiences is our students. We have quite a few volunteer Engineering Ambassadors who attend open houses, do tours and the Shadow Program, and are generally enthusiastic about sharing their experiences at Waterloo, both good and bad. Our annual March Break Open House (March 18, 2017) is one opportunity to meet them, but there are lots of applicants who can’t attend for scheduling reasons or due to long distances. So new this year, the Ambassadors have launched EngChat, where you can sign up to meet online (Skype) and have a discussion about Waterloo with a current student. I’m looking forward to hearing how this goes, but it seems like a good and valuable resource for applicants (and perhaps their parents too). For those who can’t visit campus, another useful resource is the Engineering Virtual tour below. It gives a nice overview of various places on campus (although I note that it doesn’t show any scenes from winter, which is a pretty time of year in its own way! ).